As I excitedly prepare and pack for my upcoming Joanne Williams Photo Safari to Kenya, Africa next Friday, I am making plans for the 2006 Africa adventure. The exact dates are not yet set in stone as every season varies a little according to prior weather conditions as to when migration is at its peak or how rainy the spring was that year etc. The very best months to go to this part of Africa is August through October-- August usually being the peak month. If you are at all interested in joining me on my Safari Photo “Extravaganza” next year, pencil in those months on your calendar. This trip is not just for photographers alone, but for anyone who wants to see, hear, smell, and feel the magic of Africa. This will be my sixth tour to the ‘dark continent’, and I am even more excited today than I was on my first trip! This is probably because I know great adventures lie ahead, and opportunities to see and photograph fabulous images are just a few days away. To me, being in the African bush is like being in a time capsule on a trip back to the beginning of time—it’s almost a spiritual experience. My sources tell me that this Spring was very fruitful, and that my group and I will be seeing and photographing many babies with their parents. There is something awesome yet odd about seeing a baby Rhino nursing with Mom. I say ‘odd’ as here we are photographing this huge (and sometimes dangerous) beast during one of life’s most tender moments. Nothing is cuter than watching the Thomson’s gazelle baby right after birth standing up and taking it’s first few ‘wobbley’ steps. 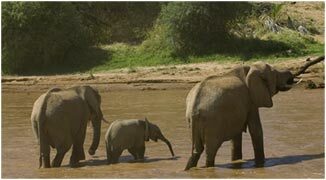 Watching a herd of elephants with their young ones being tended to by all the adults, or seeing them splashing around in the river taking a bath, or hearing the trumpeting of a warning signal is a delight to all of your senses. A brief description of this year’s tour: It’s a 21-day safari to Kenya taking you to some of the most sought-after photo (and viewing) “hot-spots” in the world. Days are spent wandering the semi-desert habitat of the Samburu Game Reserve, home of the reticulated giraffes, gerenuk, dozens of species of birds, and the elusive leopard. We visit Lake Nakuru, home of one of the largest populations of flamingos, as well as rhinos, Rothschild giraffes, and olive baboons. 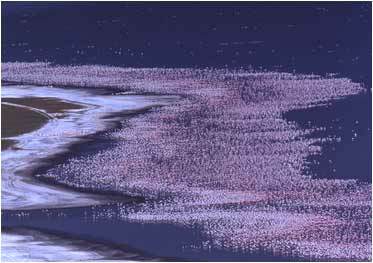 Lake Baringo, Lake Bogoria, and Lake Naivasha are on our itinerary, so that we will have the opportunity to see and photograph the scores of bird species that live there, such as, African spoonbills, the jewel-like Malachite kingfisher, and snake eagle to name a few. The Masai Mara Game Reserve is considered by many to be the premier photography location in Africa, and we will be there!!! It offers a variety of habitats and wildlife, such as; elephants, lions, hippos, Masai giraffe, zebra, gnu, impala, cheetah and leopard as permanent residents. I strive to time our trip so that we see the ‘great migration’ of the wildebeest & zebra during a river crossing. It’s awesome to see thousands of these beasts leaping into a raging river filled with 15’ to 18’ crocodiles!! 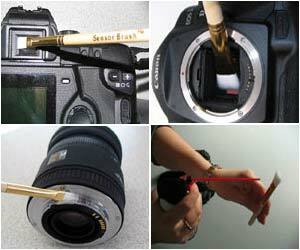 #1: I am frequently asked about sensor cleaning of the digital cameras and what I would recommend. I certainly am not an expert on the topic, but I did spend a considerable amount of time during the last PMA (Photo Marketing Association) convention in Orlando going to various booths that were giving demonstrations of their sensor cleaning products. My conclusion was and is Visible Dust (www.visibledust.com). I must be somewhat on target with my decision and recommendation as I note George Lepp—my digital guru—also recommends Visible Dust in his latest article in Outdoor Photographer. Boy, it’s fun to be right sometimes!!! #2: When traveling in and out of airports, be sure to never, never check your film. (I still use Velvia --now discontinued-- & Provia 100 slide film. Have it hand checked. True, this is not easy and can be very unpleasant to say the least. Arrive early and stand your ground!! 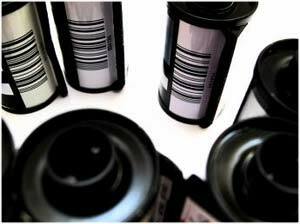 Your film CAN BE ruined, especially by cumulative scanning on long trips. Just the opposite is true about your CF cards. Slipping them in your vest pocket and walking through the security ‘arches’ is a bad idea. Your CF cards have lots of little metal parts and the arches are magnetized, which can easily send the little metal parts in chaos!